In this book Claudia Frank discusses how Melanie Klein began to develop her psychoanalysis of children. 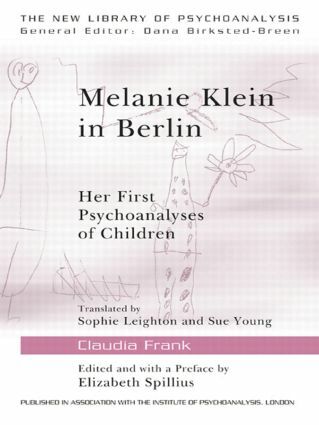 Melanie Klein in Berlin: Her First Psychoanalyses of Children offers a detailed comparative analysis of both published and unpublished material from the Melanie Klein Archives. By using previously unpublished studies, Frank demonstrates how Klein enriched the concept of negative transference and laid the basis for the innovations on both technique and theory that eventually led not only to changes in child analysis, but also to changes in the analysis of adults. Frank also uncovers the influence that this had on Klein's later theories of the paranoid-schizoid and depressive positions, and on her understanding of psychotic anxieties. early conscious and unconscious phantasies. Part two provides a translation of Klein's unpublished notes on the treatments of four of the children she analysed in Berlin: 7-year-old Grete, 2-year-old Rita, 7-year-old Inge and 6-year-old Erna. Melanie Klein in Berlin is the first text to make extensive use of Klein's unpublished papers, clinical notes, diaries and manuscripts. It will appeal to anyone involved in child psychoanalysis and the development of Melanie Klein's thinking. The beginning of the play technique – Inge and, perhaps, Ernst?